I enjoy practicing law because I find value in providing solutions to problems. 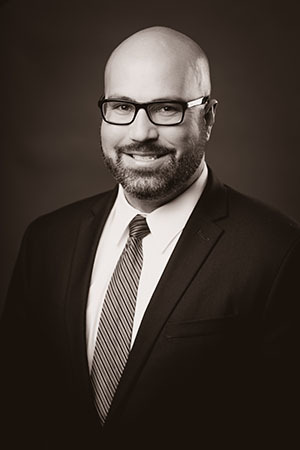 As a family law attorney, my personal, educational and professional experiences help me provide pragmatic counsel to clients who are experiencing one of the most challenging events in their lifetime. I was born in Reno as a 3rd generation Nevadan. At the age of 18 months my parents divorced, and I moved to Salt Lake City, Utah. Growing up, my life was shaped by custody orders for 17 years. I understand what it’s like to be a child subject to a custody order. Divorce and custody litigation can be an emotional time for all members of the family, it’s my goal to help a child face as little disruption to their life as possible. After graduating high school in Salt Lake City, I attended the University of Nevada, Reno where I earned a Bachelor of Arts in Speech Communication and a minor in Business Administration. My undergraduate education prepared me to be a family law attorney as my coursework included classes in listening, interpersonal relationships, public speaking and persuasion. In 2006, while attending the University of Nevada, Reno I married my best friend, Christin. I continued my education at Mississippi College where I earned my Juris Doctorate and Master of Business Administration degrees. As a law student, I interned at the Nevada Secretary of State’s Office and Washoe County Public Defenders Officer where I was sworn into limited practice. As a family law attorney, I believe my MBA plays a significant role in representing clients as divorce litigation requires the valuation and distribution of property. My MBA helps me focus on providing cost-efficient solutions by identifying my client’s opportunity costs of settling a case or continuing with litigation. Upon graduating from law school, I worked for the University of Nevada, Reno. During my time at the University, I was an Assistant Director of Development for the University of Nevada, Reno Foundation where I was responsible for the Foundation’s non-profit compliance. I also worked as a Contract’s Officer for the Office of Sponsored Projects where I drafted contracts for research. My experience in drafting contracts for the University serves me well in family law as most divorce and custody cases are resolved through a settlement agreement. I also have previous legal experience as an attorney practicing insurance defense and social security disability . Prior to joining Silverman Kattelman Springgate, Chtd., I was a judicial law clerk from 2016-2018 in Department 14 of the Second Judicial District Court. In this capacity I worked side by side with many of our Family Court Judges and learned firsthand how cases are reviewed and decided by Nevada judges. Having knowledge of the intricacies of our legal system allows me to provide unique counsel to my clients. I am licensed to practice law in Nevada and Utah. I am a member of the Washoe County Bar, The Bruce R. Thompson American Inn of Court, Lambda Pi Eta – The National Communication Association Honor Society and Phi Delta Phi – The International Legal Honor Society. * My Utah license is on inactive status.